It is easy for us to get caught up in our own drama and to lose perspective of what the larger picture is really all about. To some extent that is what I did yesterday. My own primary focus on DNA research is to find information that will allow me to extend the history of my own family and the families of extended family members—particularly those of the ancestors of my grandchildren. I am also very interested in learning about the health implications of our genomes and what we can learn about the historic journey of the human race. However, my original interest in DNA research was to find information from within my body and those of my family members that would help me as a genealogist to extend what I have been able to learn from extant oral and documentary information. In this quest I have been somewhat successful. 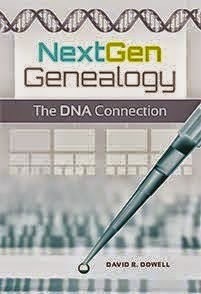 I continue to look to each new DNA tool for new insight that will help me extend these genealogies. This is the perspective from which I first examined my results from Geno 2.0 yesterday. In so doing was I missing the real point of this exciting new project? I was looking to build backward incrementally from what I already knew from my prior genealogical research. Geno 2.0 begins its story from the other end of the human narrative. Its primary focus is anthropological rather than genealogical. Although these two foci are ultimately complementary, they remain only loosely connected. Both approaches are seeking to connect with the other; but each are building from opposite ends of this long human journey. In some ways this effort is analogous with the building of the transcontinental railroad across North America in the 1860s. Two efforts, launched from 1,770 miles apart, needed to standardize their gauge (rail width) and come together at a common point. That project was to connect two geographic locations existing in the same time dimension. Our genetic genealogy effort today is to connect different eras of the human journey. When I first surveyed my results yesterday, I had on my genealogical tinted glasses. My own agenda of extending my own family histories back from North America to Europe colored what I saw or didn't see. I was trying to make an anthropological tool into a genealogical tool. It is not significantly different from trying to use a pair of pliers for a task for which a wrench is better suited. Sometimes this will work and sometimes not. In my post yesterday I tried to compare Geno 2.0 with the new Ancestry Composition tool that 23andMe introduced last week. My colleague CeCe Moore, Your Genetic Genealogist, gently pointed out that these two tools were looking at different times along the migration of my ancestors. Ancestry Composition was helping me look for my family at the dawn of genealogical time or about 500 years ago. On the other hand Geno 2.0 was trying to focus further back. Both tools can be useful but their reported results must be viewed appropriately. With this in mind I’ll begin to review my Geno 2.0 and my Ancestry Composition reports from a different perspective. I’ll share my observations here shortly.